If I hit with a Trygon Predator, does the artifact get removed before the next effect goes on the stack? Inkfathom Infiltrator can't block and is unblockable. If you're not interested in Nightveil Sprite , then I would consider dropping Inkfathom Infiltrator for perhaps Sower of Temptation or Faerie Harbinger to grab exactly Oona's Blackguard , and then putting in Secluded Glen for more fast land. I have a deck that consistently gets fast mana with glen using a similar package. You could also add a Glen Elendra Liege for even more faeries. If you're scared of reanimation decks, then Faerie Trickery is a card as well. I've enjoyed 1 drops with late game utility like Deadeye Tracker and Mistcaller. I'm not sold on Quietus Spike, Inkfathom Infiltrator, or Thassa, God of the Sea since they seem very mana intensive for what they do. I might consider Keeper of Keys over Sun Quan, Lord of Wu as you can easily take back the monarchy with unblockable things or bouncing it back to your hand. Proteus Staff looks really awesome.I have a list on my deckling, if you want to compare, but it's a little more budget friendly. akkd Thanks man! A lot of good ideas actually came from here so I have to thank those that helped me build this deck. Anyhow, the creatures line-up would surely benefit from an update. The thing is that this deck is still only a prototype and I'm not playing these days (months, actually...). 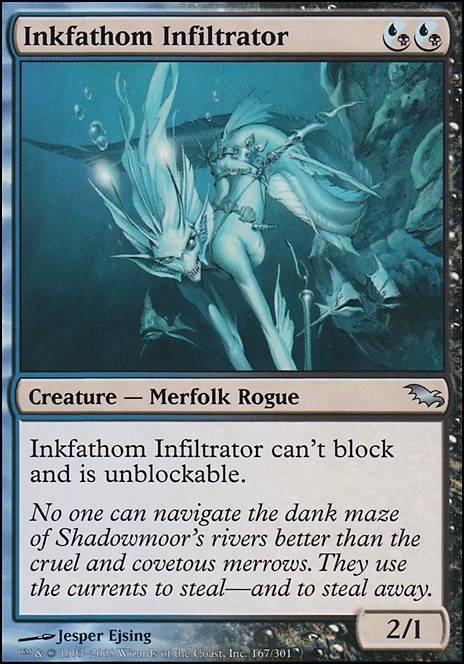 I try to keep as "generic" as I can, so Inkfathom Infiltrator is better than Oona's Prowler because the former can never be blocked. The latter would make a great sideboard card, though (that's another thing I haven't tweaked for a long while, btw). Same for Cold-Eyed Selkie. Also, Aqueous Form would come in handy whenever I might need more sneakiness. This is something I will surely review in the future. Maybe they are too many, but hexproof is damn great and I hate to see a creature with like 7 mana of equipment wiped away by a spell. 3 might be ok all the same, however. I don't know about Tetsuko Umezawa. I believe once rogue effects trigger basically any creature of mine is out of reach of her effect. Awsome deck man+1 definetly! I've made a couple of changes of my own regarding the creatures (will have a look later on the lands and the Dispell ). -I've replaced 4x Inkfathom Infiltrator for 4x Oona's Prowler ( personally, I believe the trade off between being "unblockable" for a bigger dmg (3/1) + possiblity of hand disrupt + its mana cost is 1 colorless and 1 black(so we are able to decrease its cost through Frogtosser Banneret , which we didn't manage to do w/ Inkfathom Infiltrator due to their 2 CMC being both blac/blue) + keeping the rogue tribal aspect, preserving that way the possibility of getting pumped like every other creature we have better in an overall way. -I've replaced 2x Triton Shorestalker for 2x Vampire Cutthroat. The tradeoff between being only unblockable, compared with her skulk hability + lifelink + preserving its rogue aspect, which enables her to get pumped as well better. -I've decreased 1 unity of Invisible Stalker, I thought 4 was too much. -I've withdrawn 1x of Hands of Binding , since the Royal Assassin was now off, I didn't see much use to it. -I've added 1x Aqueous Form + 3x Cold-Eyed Selkie for draw engine, and again, preserving its caracteristics of being a rogue (able of getting pumped) and able of having its CMC decreased by 1 due to its colorless mana. lagotripha Not a bad idea, especially cutthroat, might cut the earwig for them to make it more aggro. Faerie Macabre might be better than surgical on some matchup as it offers a nice body. 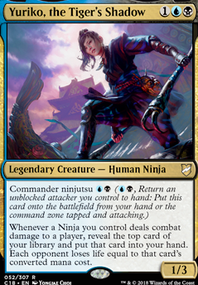 Shadow Alley Denizen isn't bad but most of my creatures have an evasion ability already is it feels kind of redundant. Guul Draz Vampire is a bad early game draw and I rather stay away from it. Inkfathom Infiltrator will be considered instead of oona's prowler. 2 damage is better than 3 reduced to 1.